CENTRALIA, Mo. -- A Vietnam War soldier has been buried next to his parents in Missouri more than four decades after he died in an Army helicopter crash. 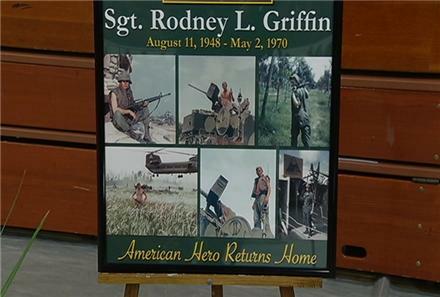 The remains of Rodney Griffin, a Centralia man who was 21 in 1970 when his helicopter was shot down in Cambodia, were taken Saturday to a cemetery in Mexico, Mo., in a flag-draped casket. In a memorial service at Centralia High School beforehand, friends recalled Griffin as popular, charismatic, vivacious and mischievous, the Columbia Missourian reports. "A prankster? Yes he was. Charismatic? Oh. My. Gosh," said Gary Prenger, one of Griffin's best friends. "You just had to understand his charisma. ... Mischievous, living on the edge, pushing the envelope. Up for any challenge. Good or bad, he had your back, and always had mine." Service members also turned out to pay their respects, saluting as everyone else held their hands over their hearts. Ron Azdell, a Vietnam veteran, said most veterans from the war received no fanfare when they came home. "When I came home, people acted like I had never been gone," Azdell said. "For most of these guys - they're Vietnam veterans, mostly - they're going to make darn sure somebody's going to recognize that they (other veterans) have gone." Griffin's relatives were told in February that his remains had been found in a grave near the crash site, where two other men killed in the crash also were identified. Sallye Goodin, 53, a cousin, said that on the day Griffin left for deployment, she chased after the departing bus he was aboard. "I remember crying and begging him, 'Please don't go,' because I felt like he wasn't going to make it back," Goodin said. "I knew that he didn't have a choice."